Evening At The Beach is a photograph by HH Photography of Florida which was uploaded on September 2nd, 2018. 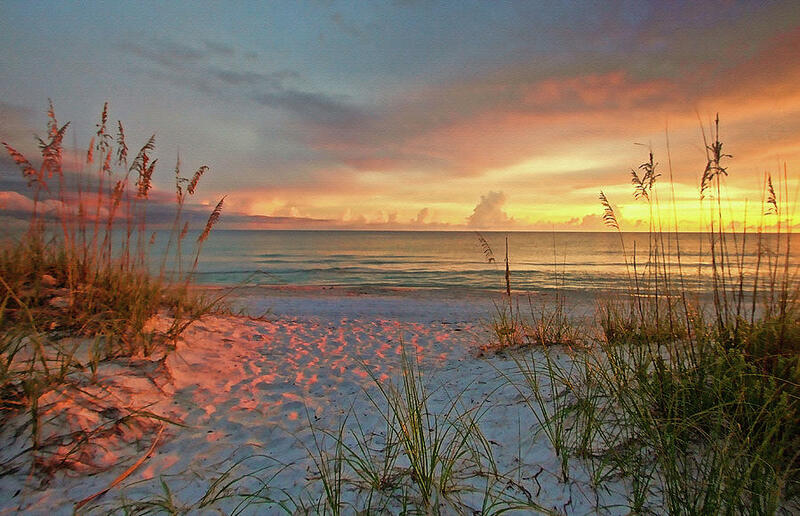 Evening At The Beach by HH Photography of Florida. As the sun prepares to disappear for yet another day, the sunlight of early evening bathes the seaoats and beach sand with warm tones on this late day visit to the shore. Such a wonderful, relaxing time for a beach walk and it looks like we may have it all to ourselves. A few lingering clouds, left behind from earlier rain storms over the Gulf of Mexico, dot the distant horizon. From the placid waters to the soft, warm sunlight and peaceful atmosphere, a zen-like feeling settles over the closing of this day here on the Florida Suncoast. Thank you all so much for the sale congrats. Much appreciated. I am a fan of nice sunsets and this one is super. Congratulations on your sale. Lovely scene - congratulations on your sale. Beautiful Helen! Congrats on your sale! Gorgeous image, congrats on your sale. Congratulations on your sale of this beautiful print! Stunning light and color in this pretty beach scene. Congratulations on the recent sale. How beautiful! Congratulations on your sale! Thank you very much, Loretta. Thank you, Dianne, and thanks so much for the feature in the Scenes From A Beach group. Thank you, Bill & Deb.